Red clay, mud. 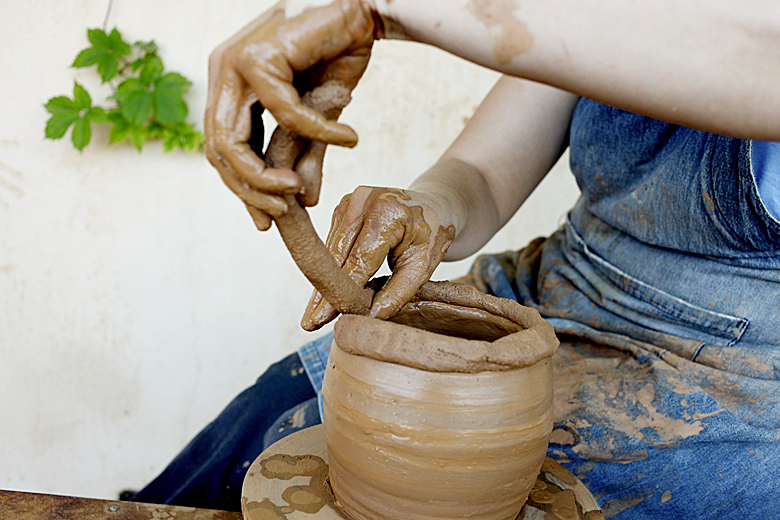 I admire potters, but I cannot do what they do. I do not like mud. It gets everywhere; in your hands, boots, clothes, and hair. In my job, I can send it to the geological lab to squeeze it, break it apart, find out what it is made of, and how it behaves. But then I remember this from Crete, people for thousands of years carry the need to use clay in their genes and this human story humbles me. Greek, works on the island of Crete for special projects. An archaeologist is like a poet, making the invisible visible. Layer by layer, she digs deeper to find the evidence for the vision she is hoping to discover. An encounter with the past. The clay is the medium that connects the broken line making it unbroken for us to see. The invisible has become visible sharing the presence with the ancients where the hand joins the Minoan hand in the celebration of 'De Gustibus'. Finish, inspired by culinary traditions on the Island of Crete. As with many of the world's religions and mythologies, it is said that the Greek God Prometheus molded man from clay and Goddess Athena breathed life into him. For as long as we can remember, we too have molded and shaped the body of Mother Earth to create vessels, clay wombs that hold and give nourishment as a mother does for her child. Everything in existence is spinning: The potter's wheel, dust motes, the planets, the seasons, circles of life. When we drink from that cup, I cannot help but wonder: Who is the Potter that created it all? 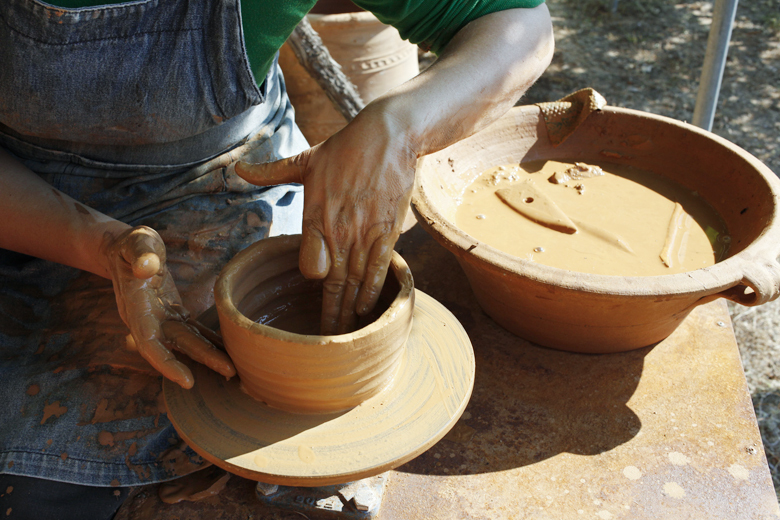 Clay, water, wheel – are the three components that create a clay dish. Additionally, the potter’s passion for this art must be present. 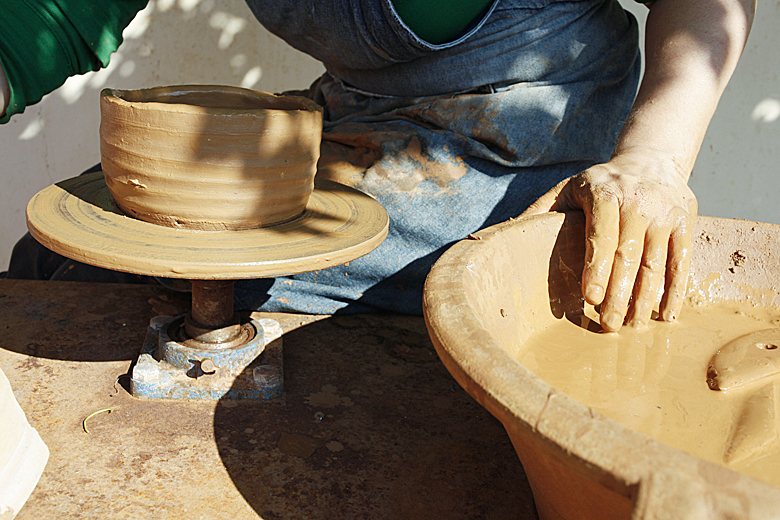 Pottery has been apart of every Cretan’s life, from the Minoan period (8000 years ago) until today. From the time of the Minoans, pottery has been used as utensils, serving people’s needs for cooking, serving and storage. This is one of our amazing traditions! 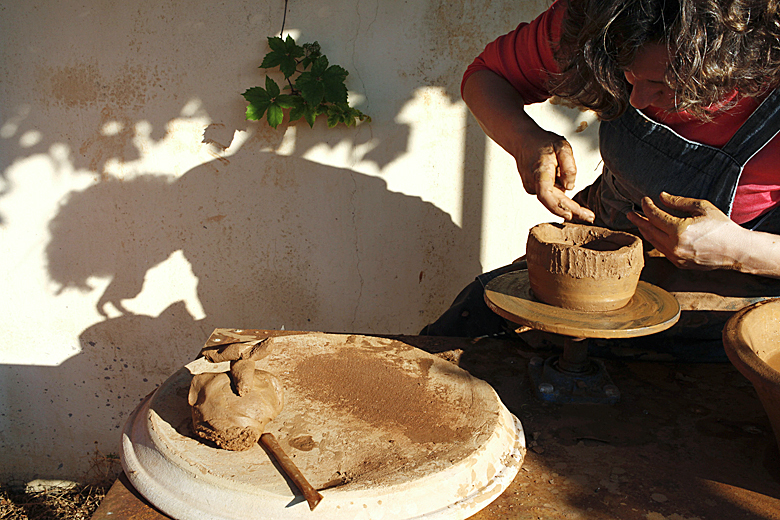 Cretans often use clay cookware, which enhanced the taste of our dishes. 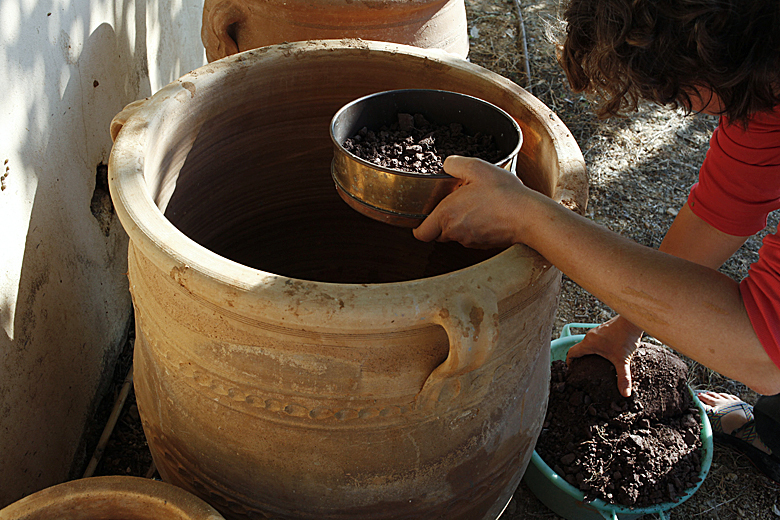 So if you come to Crete, do not miss out on our culinary delights cooked in a clay pot. Crete’s rugged peaks, soft valleys, and elusive coastline conjure feelings of being fierce and gracious. These contrasting elements are married in this land and together they created a dramatic backdrop for civilizations to raise and fall. The Minoan civilization is one of many that belong here, but its seemingly playful and peaceful nature is distinct. Paintings of the floral and faunal of Crete, mixed with images of human actions, and the ever-present female iconography is in contrast to the realities of daily life. I am drawn to the mysteries of the mundane, and as such take a pragmatic investigation of the ancient world. I have nurtured my connection to Minoan Crete by recreating the task of cooking. It begins with collecting clays and food from remnants of the ancient landscape to prepare Minoan-style cooking pots that are used to prepare a meal over a hearth flame. By sharing this meal we create bridges between Crete’s past and our present and between our individual selves and our neighbors. American, inspired by the Island of Crete. 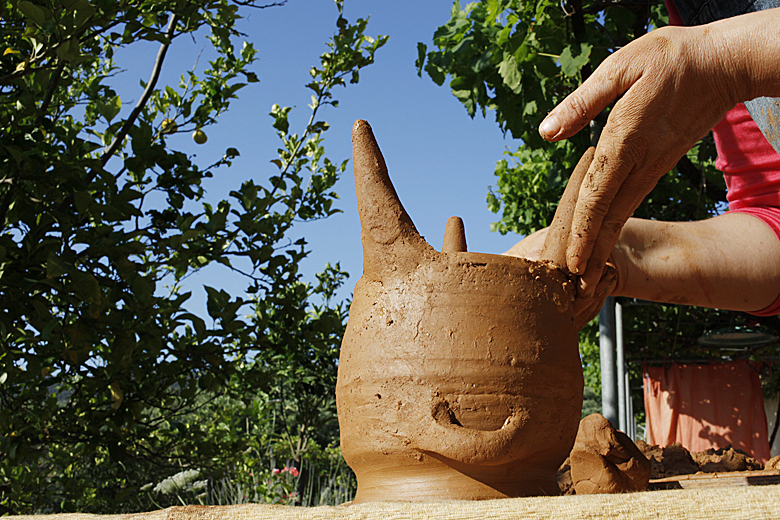 Clay: dug from the Cretan mountainside; coiled and coaxed into Minoan shapes by the skill of the potter’s hands. In the kiln, clay transforms fired ceramic through the magical power of fire. Centuries later, touched by the archaeologist’s hands, the pottery fragments have a second life: counted, catalogued, hidden in museum boxes, but a doorway to the past. Captured within those dusty sherds are Minoan memories: stews bubbling in the tripod pot, aromas wafting through the house, anticipating the simple pleasures of a meal shared. Irish, exploring and working on the island of Crete. Starting from scratch. She began her quest to experience Minoan dining at its beginning. 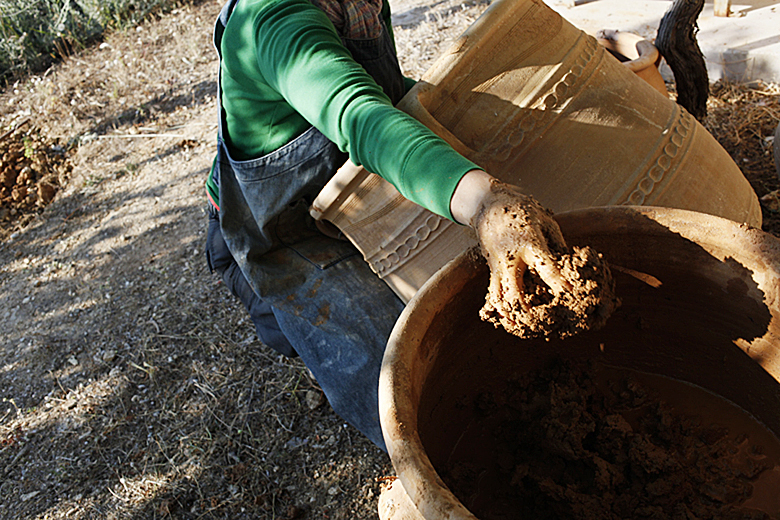 Here she prepares the clay (used during the Middle and Late Minoan period at Mochlos, a site in East Crete), to make the pot (into the shapes of all sorts of Minoan cookpots), to cook the food (using only ingredients that were available on Crete 3,500 years ago) that you can eat for your favorite Minoan Tastes dinner! Des poteriess’échappent les effluves de vinaigre, de miel, de citron, de lentilles, d’artichaut, de fenouil, de mouton, d’amande, de romarin et d’origan qui mijotent. Le fumet sortant des plats se mêledélicieusement à l’odeur des galettescroquantesd’orgeparfumées au thym, qui gonflentetgrillent à côtésur la braise. 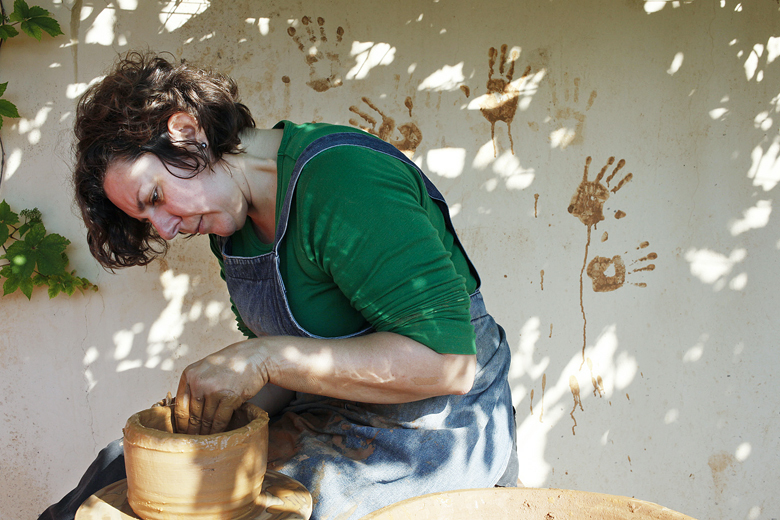 Leaning on the potter’s wheel, in the evening light, the cook grows from her hands a container to prepare Minoan-style dishes. Smoothing the clay to create the wanted shape, she already knows the recipes to lovingly cook. The pot will simmer for hours.